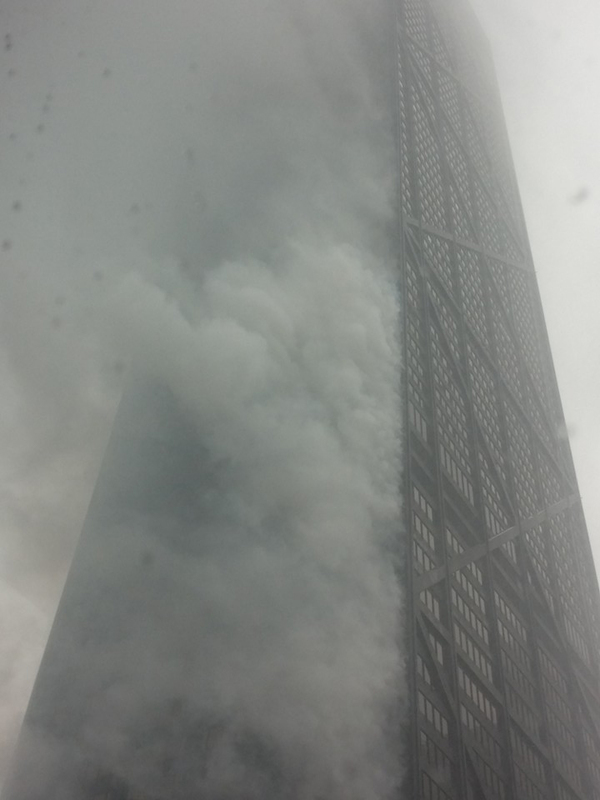 CHICAGO (WLS) -- Five people sustained minor injuries in a fire that broke out in the iconic John Hancock Center Saturday afternoon. The fire broke out just a few hours before the Magnificent Mile Lights Festival was to begin on Michigan Avenue. Fire officials said it took only about a half hour to put the flames out and while the homeowner on the 50th floor remained unharmed, her unit was completely gutted by flames. Mary Minow, who lives in the unit above where the fire began, said she noticed a strange smell and then opened her front door to find smoke filling the hallway. "I went into the hallway and there were other neighbors who smelled smoke," she said. "The elevator didn't work, so we went five (flights of) stairs, down to 44 and that elevator took us down." Calls for help from the iconic 100-story high rise began around 2:30 p.m. after thick smoke and flames began shooting from the building's east side. More than 100 firefighters and six ambulances arrived at the scene. There was never a full evacuation of the building, which also has retail stores, offices, an observatory and a restaurant-bar on the 95th floor - where tourist Kim Wichman was. "It's scary because you always think of 9/11, when the fire and the building collapsed," she said. "You don't know what the structure's like." While some people in the building decided to stay put, others opted to get out by descending dozens of flights of stairs. "We started going down," said Jessica Mays. "I had my scarf covering my mouth. The smoke was terrible." In all, five people received minor injuries, including a Chicago police officer who suffered smoke inhalation when he tried to warn residents about the flames. The fire is still under investigation. Some residents like Dr. John Whapham remain concerned that the building's fire safety standards may not be enough to keep something bad from happening again. He said the building does have smoke detectors, but under the city's fire ordinance, owners of high rises built before 1975 are not required to install sprinklers. "Not a single alarm, not a single announcement anywhere, nor did the expensive alarms we spent the last year and a half putting in go off, and nothing," Whapham said. "To my knowledge it was functioning, it was intermittent and the building owners looking at that," said Deputy Commissioner John McNicholas, Chicago Fire Department. The Hancock Center, located on the 800-block of N. Michigan Ave. in the city's Streeterville neighborhood, is the fourth tallest building in Chicago. The building has 700 private, luxury condominium units, according to the its website.